Try to remember the last conference that you attended. How many talks did you want to follow? How many talks could you follow? In how many talks did the speaker made any effort to help you follow? The answers that I give to the last two questions convinced me early in my career that the meager amount of time that I spend away of my family should be spent with co-authors rather than in conferences. But sometimes there are conferences in which the answer to the first question convinces me that I should join my colleagues in an attempt to follow speakers. I was sitting in the conference hall in Toulouse, looking around, observing the people in the audience yawn, surf the web, read papers, talk to each other, sometimes even take a nap. True, there were clear and interesting talks, but many speakers lost their audience within a minute. And these speakers were sitting in the audience before their talk and could not follow the talks of others (I noticed them surfing the web…). When preparing a presentation, my rule is to spend 5 minutes on each slide, to use a large font and to refrain from having equations on the slide as much as possible. Thus, a 30-minute talk translates to 6 slides. Knowing that 5 minutes per slide may be a little too much, to my talk at Toulouse I prepared 8 slides (lo and behold, I did not reach the last one!) In contrast, some speakers had 30 slides with small fonts and many equations for a 30-minute talk. Did they really think that people can follow one slide per minute? Can they do it? And some people simply jump over slides saying they are not important. If they are not, why are they there? Why didn’t they prepare the talk in advance? Some people provide the formal definition of the model, with all measurability conditions and exact sets of strategies. Is it important for the talk? Wouldn’t a verbal description suffice, something like “players choose strategies in continuous time that ensure that the play path is well defined”, and mention the term that people use for this type of strategies? People who are not in the field do not care anyway about measurability conditions and the formal definition of strategies in continuous time. Some speakers provide the full list of notations; can they remember notations that were defined two slides ago and were hardly shown on the screen? So why do people give bad presentations? Why do they not invest more time and energy at home? I thought that people talk at conferences to spread their work: after all, who reads papers these days? But then to give a bad presentation is a waste of time: you lose your audience and nobody will remember what you did. I would understand if the conference were at Paris, Rome or Beijing. Then there are other reasons to attend it. But even though Toulouse has a rich history I think that it is not sufficiently interesting to attract the average tourist. Anyone can help in figuring out this puzzle: What is the utility of the average game theorist that explains why he/she gives a bad presentation in a non-touristic city? Last week I visited Geneve, Switzerland, for one night on my way to the great conference that the French group organized in Toulouse. More on the conference in subsequent posts. Here I want to write on something else. On my way from the lakefront of Lake Leman, where I spent a couple of hours refereeing papers, to the hotel, I came across a preschool. 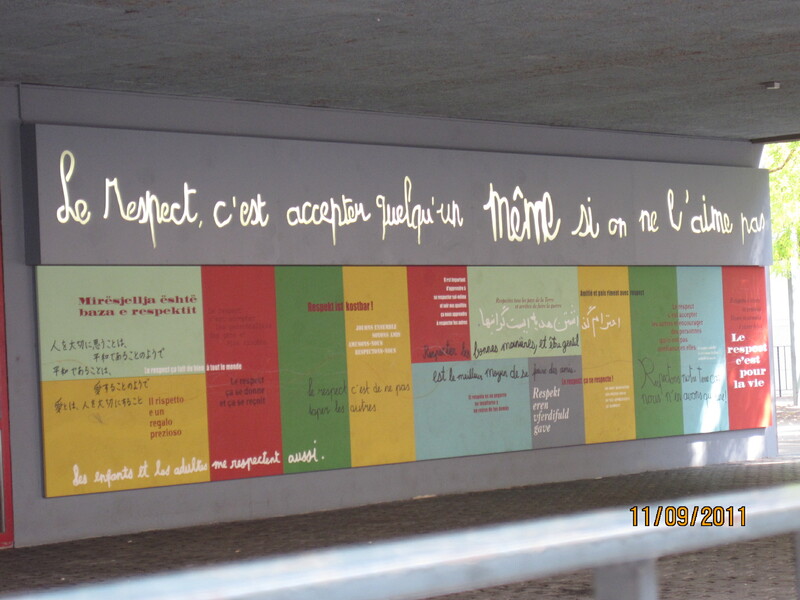 Two slogans were written on a wall, one next to the other. 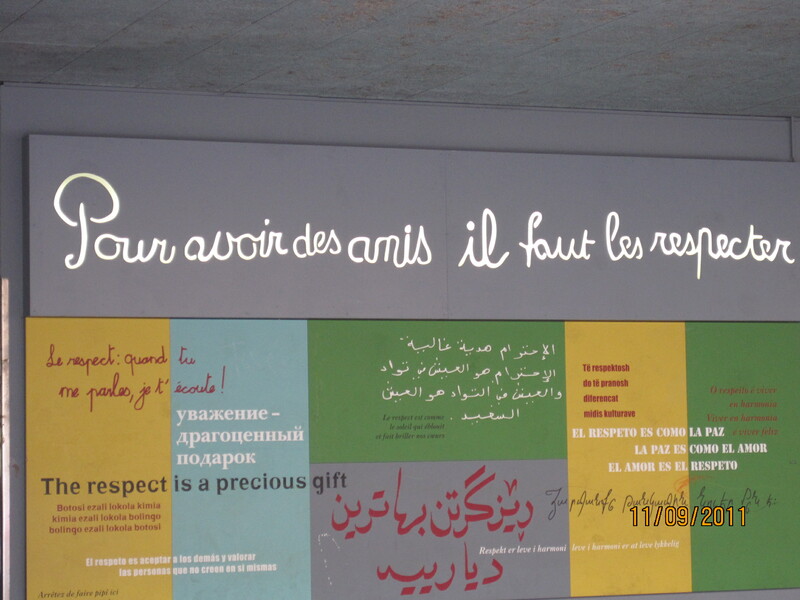 The first slogan says “Pour avoir des amis il faut les respecter”: to have friends one must respect them. I salute to the insight of the Genevians. The second slogan is not less insightful: “Le respect c’est accepter quelqu’un même si on ne l’aime pas”: respect is accepting someone even if you don’t like him. Even though each sentence separately makes sense, when one puts them next to each other the conclusion is rather grim. There is a reason why kids ignore what they teach them in school. My eye was caught by an article in the WSJ (Sept. 1, 2011) by Melissa Korn. Korn spies a trend among B-schools in requiring their applicants to respond to questions with answers that use no more than some small number of words. The trend, according to Korn, is prompted by a desire for greater authenticity and honesty in applications. The problem with the standard essay format is that it produces responses that are carefully crafted. Setting aside my prejudice in favor of thoughtful, polished prose and extended chains of reasoning, I don’t see why a 140 character missive cannot also be carefully crafted. Furthermore, it is unclear that a 140 character missive conveys anymore `authenticity’ than a longer essay. Think, for example, of advertising. We don’t usually associate pithy promotional text exhorting us to purchase this that or the other with `authenticity’. ancient form of poetry in a contemporary medium. Suggesting that had the same haiku been submitted on a square of toilet paper it would have been dismissed as combining an ancient form of poetry with an even more ancient medium. Finally, advice for those applying to Haas. The answer to the question: What gives you the greatest joy? There is only one correct answer: INSIGHT.